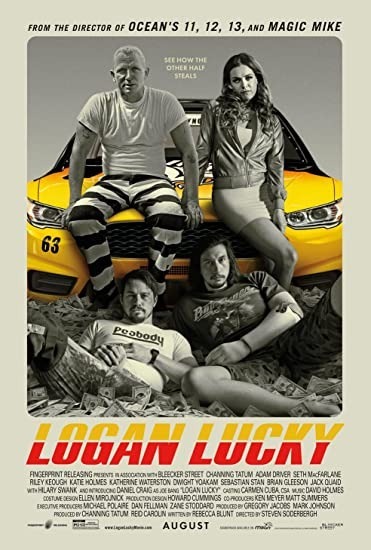 Jimmy Logan (Channing Tatum), a blue collar laborer whose once promising football career was ruined by an injury, is laid off from his construction job at the Charlotte Motor Speedway. While visiting his ex-wife Bobbie Jo (Katie Holmes) to pick up their daughter Sadie for a beauty pageant, he learns that Bobbie and her new husband intend to move to Lynchburg, making it even harder for him to visit. Angry, Jimmy goes to a bar run by his brother Clyde (Adam Driver), an Iraq War veteran who, on account of losing part of his left arm, wears a prosthetic hand. Max Chilblain (Seth MacFarlane), a pretentious British businessman & NASCAR team owner, and his friends arrive and insult Clyde before getting in a fight with Jimmy. Meanwhile Clyde sets fire to their car with a molotov cocktail. On his way out, Jimmy yells "cauliflower", which Clyde recognizes as an old code word from when they used to commit crimes as young boys. Next day, Jimmy explains his plan to rob Speedway, exploiting his knowledge of their pneumatic tube system for moving money. Read more on Wikipedia.